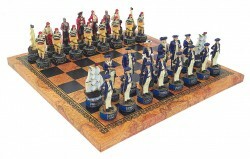 Pirate vs the British Navy Chess set. Wooden leatherette Board measures 33 x 33 cm (13 inches). 2cm thick.